Quantico reveals more secrets and—wait, where are you going? Quantico has slowly but surely improved after cranking through the knotty process of setting up its elaborate, miles-long row of narrative dominoes, but with so much happening in the plot, it’s probably naive to assume that’s a finite process. At this point, it looks like Quantico will be springing new surprises and insane reveals until its final moments, and that means it’ll always be a pretty frustrating show even at its most engaging. 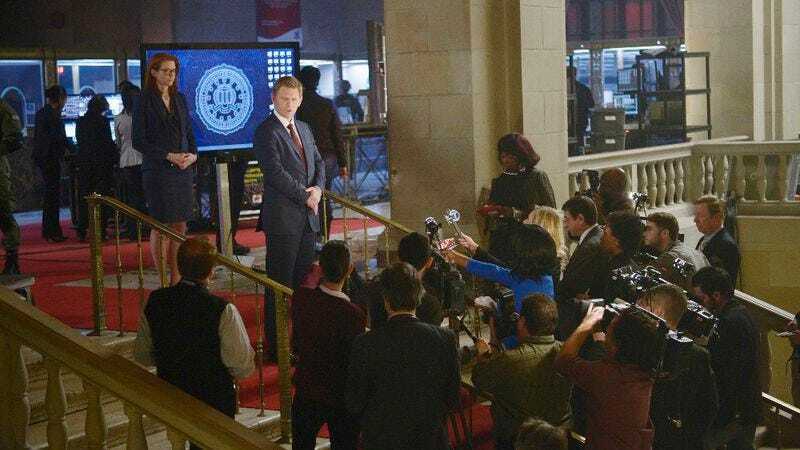 “Over” has the disadvantage of coming behind “Go,” Quantico’s smoothest, most engaging episode yet, which makes it all the disheartening to be reminded how much seemingly random story there is to burn through. Simply put, Quantico is at its best when it ignores two-thirds of the story it’s trying to tell. Consider that we’re eight episodes in and Nathalie is still running around with a fake scar behind her ear for reasons unknown. And there’s nothing wrong with that as a component of a heavily serialized thriller, but as one of 15,000 components, it feels downright burdensome. There’s no direct reference to Nathalie’s faux scar in “Over,” but there is significant movement on a couple of other unresolved mysteries that serves to remind the audience that Quantico has a bottomless bag of tricks. Shelby’s been making secret, whispery phone calls to Riyadh, which, as it turns out, were to her Saudi half-sister who was conceived during her father’s affair. Caleb, meanwhile, reveals that he was part of a cult when he was younger, and he’s been using the fake Facebook profile to correspond with the same cult (or maybe a different cult, who even knows) ostensibly to disrupt their operations from the inside. Maybe those reveals will lead to something satisfying in the future, but as their own plot points, neither is especially effective. But Quantico is first and foremost about Alex Parrish and her efforts to clear her name following the Grand Central bombing. That story that will hopefully gain more traction now that the rest of Alex’s Quantico cohort has been rounded up, and maybe or maybe not cleared of involvement in the bombing, and Alex has turned herself in to stop a suspected second bomb from detonating. The manhunt for Alex was an exciting start to the season, but it isn’t a sustainable direction for the show, if only because the longer there’s a frenzied search for Alex, the stupider the FBI looks. Granted, the FBI already looks plenty stupid, unless the goal of the FBI’s training program is to recruit a bunch of broken people living double lives, then put them through a battery of cruel psychological tests, one of which has already resulted in a suicide. But now, following a major terrorist attack, someone has left a pretty obvious trail of crumbs leading directly to Alex, and no one except for the least trained and experienced people working for the agency can manage to grasp that just maybe Alex is not the culprit. It also looks pretty stupid that Ryan is still hanging out with the NATs after being relieved of his spying duties by Liam and in a position to return to the field. Liam asks Ryan why he’s still sticking around Quantico, and Ryan says he’s doing it to make sure Liam can’t spring anymore of his mind games on Alex. Sorry to break it to you Ryan, but this entire training process is about mind games, which you should probably know having already gone through it before. In addition to the ridiculousness of having an agent just tell a superior “No thanks, I’m actually going to just continue being a trainee,” shouldn’t Ryan have an idea of how all these exercises and drills work if he’s already done them? He only becomes a credentialed agent when it comes time to help Alex slip into a storage room to uncover more secrets about her parents. Then later, when Alex fumbles the training exercise by carrying a bomb into the building, Ryan is just as surprised as anyone. Maybe a refresher course is exactly what Ryan needs. Regarding the latest purloined FBI file, Liam steals it back from Alex before she can get a look at it, but when she confronts him, he admits his failure to prevent an attack that killed 204 people, an attack her father also failed to stop. The truth about Alex’s father is one of the least interesting plotlines in a story with a lot of not very interesting ones, but this is obviously a false stop before more Parrish family secrets are revealed later. As usual, I’m far more interested in the present-day investigation, and I’m never excited about the cliffhangers set in the past because, again, there’s ultimately only so much they can mean for the story. This installment ends with Miranda bleeding out after being attacked by Charlie, but Miranda is alive and well and in FBI custody, so all’s well that ends well. I’ll say this much: If Charlie turns out to be the Grand Central bomber, I’ll take back every negative thing I’ve ever said about this show. Because that would be pretty hilarious. As far as Shelby’s love life is concerned, I’m Team Director Clayton, not Team Caleb. I do quite like the bizarre love triangle between Nimah, Raina, and Simon now that the twins’ secret is out. Simon thought he’d been romancing Nimah all along, only to find out that neither Nimah nor Raina is who he thought. But Simon is still keeping secrets so he probably doesn’t have a lot of time for a romance anyway. So…Charlie. I’m going to ask one more time: How old is this person supposed to be? 7? 21? 42? I can’t call it. He reminds me of Leo from Smash, one of the most irritating teenagers in the history of contemporary television. Also about Charlie, does the FBI not have, like, security clearances and stuff? Can you really just take your kid (your kid who tried to perpetrate a terrorist attack) to work with you and give him full access to training exercises? I’m going to start a drinking game in which I take a shot every time someone does something that would almost certainly result in a Congressional probe.